The Gibson Firebird, (above is a real one), was created by Detroit car designer Ray Dietrich at the request of legendary then Gibson main man Ted McCarty, had a more rounded out Explorer shape with “neck-through” construction*, (neck and centre of the body are one piece with “wings” glued to either side). This Firebird, (above) was not designed by Dietrich. It’s a weird looking bird. From left to right; The control knobs are the wrong type, they should be top hats with silver inserts not speed knobs. The pots that they sit on are incorrectly placed, due in part to there not being enough space below the bridge as the body shape is just plain wrong, (the treble front horn far too pointed). The pickups on a Firebird should be mini humbucker style* and no real Gibson comes with decals on the pickups. The pick guard is the wrong shape, again probably to fit the awkward body shape, and it has no Firebird emblem on it next to the pick up selector switch. Looking at the headstock, which is the wrong shape, we see that the tuners are wrong*, they should be the so called “banjo” tuners. 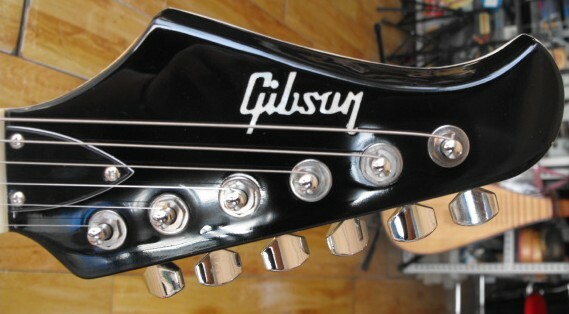 The truss rod cover is incorrect and would usually take up a fair chunk of the headstock and would have the Gibson logo on it, not inlaid into the headstock. *The Firebird Studio differs from other Firebirds in that it has set neck construction, regular sized humbuckers and regular style tuners. 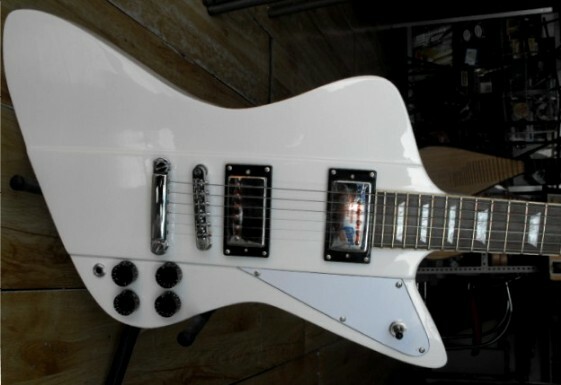 This guitar was advertised as a Gibson Firebird V.